"Bonjour." That's just about the only French word I used on my entire trip to Quebec City, I'm happy to see my French classes were able to give me a solid grasp of the language. My friends and I wanted to do something adventurous and out of our normal routine this summer so instead of watching movies on a couch all day we decided to go out and see the a little slice of the world for a weekend. Everyone I had asked about Quebec City said it was a "mini-Europe" which sounded perfect to me because I have never been nor am I able to fund a Europe trip for myself at the moment. 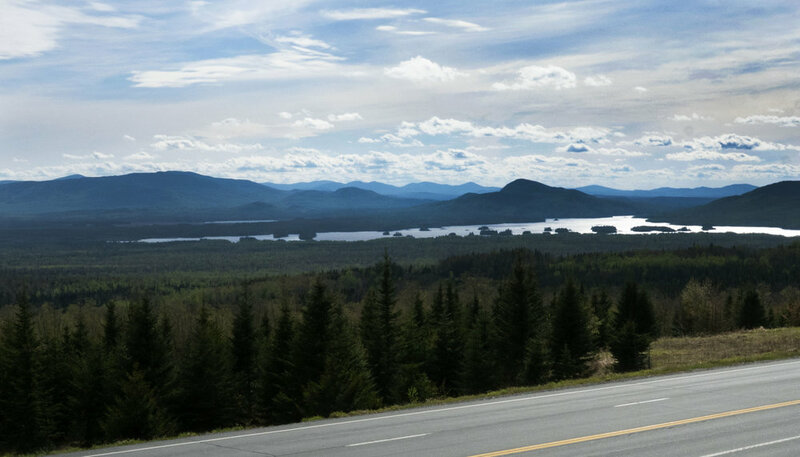 The drive from Boston to Quebec City is about six and a half hours through the lush forest of northern New England. On the way up we decided to go through New Hampshire which cuts straight through my favorite hiking spot, the White Mountains. In the days ahead of the trip we found a cute diner just ten minutes from the range called Polly's Pancake Parlor. I am an EXTREME foodie and take it seriously so trying new food places stresses me out, especially when they're in the middle of nowhere. But I was pleasantly surprised when we pulled up to the diner. With the entire White Mountain range situated down the street, Polly's Pancakes had some of the best breakfast food I had ever had. My friends and I will definitely make it back when we go hiking in the summer. After a quick food break we made our way to visit our friendly neighbors to the north. When we first arrived we got lunch and then made our way to our Airbnb which was just ten minutes from downtown Quebec City. We then made our way to the city to explore. Everyone was right, we had felt like we were transported to what I assume Europe would look like, just at a fraction of the cost. Cute alleyways, beautiful architecture and lush greens adorned the city with the most magnificent view of the St. Lawrence River, Jacques-Cartier National Park and the entire skyline all in one glance. I have been to a lot of cities, but none quite like this one. Being from Boston, we're used to having historic relics surrounding us at all times, but Quebec City has all of that and so much more. The next day we drove ten minutes in the opposite direction to the city to Ile d'Orleans. As soon as we crossed over the bridge it had felt like we had been transported to a quaint village in a coastal European town. We came early in the season so a lot of the shops to the west of the island were still closed, but luckily for us the bike and moped rental shop was open. The staff at Motel Ile d'Orleans were extremely hospitable, spirited and helpful with their knowledge of all the need to do things on the island. Before we left an employee drew us a map of all the shops we had to stop at prior to returning our mopeds. Driving the mopeds around the island was hands down one of my favorite moments of this entire trip. While a little on the pricier side, it's totally worth it to be able to zip around the country side and stop in the cute stores. A few of our favorites were Cassis Monna & Filles for their AMAZING black current wines and liquors and Un Des 2 for lunch. The views from all angles of the island were amazing. To one side you could see the entire skyline of Quebec City, to the other you saw the bridge that leads you to the island and farm land. From one spot you could even see the Montmorency Falls which was our next stop. I used to live in Hawaii, so waterfalls are kind of my thing. Being taller than the Niagara Falls, the Montmorency Falls has look out spots in several areas and allows you to go right up the the base of the falls as well as walk over a suspension bridge over top. The next day was our final day and had us seriously considering changing our citizenship (none of know the Canadian National Anthem though so our chances were slim to none on that one.) We took one final walk through Le Petite Champlain and the waterfront and parted ways with Canada. On the way down we drove through Maine which was one of the most beautiful routes I have ever driven through in my life and was a perfect ending to this amazing trip.